Great news for biathlon fans, coaches, and sports players. LASERWAR made a new "Laser Biathlon" set. Young sports players will now receive the highest world standards level rifle for running fully-featured training sessions. This compact, stylish, lightweight, ergonomic rifle can compete with the best samples of biathlon weapons with which honored sports players train. The stock of rifle is produced of beechwood or nutwood, because these material are light, durable and well-recognized among gunmaker all over the world. Gunmakers know, that for proper operation wood should be "breathable", that’s why it is not colored but covered with a special impregnation. The pistol grip handle has a special anti-slip notching for comfortable fitting in the hand, allowing a player to securely hold the weapon. The buttstock of the gun has an option of heel plate and cheekpiece adjusting for fitting individual anatomical features of any player. This option makes it possible to use 100% of capabilities of this new rifle. The rifle has a dual reload mechanism. Classic biathlon reload bolt will simulate using a small-caliber rifle, and the youngest sports players can use more convenient reload via pressing the thumb of the right hand on the lever of the extender. 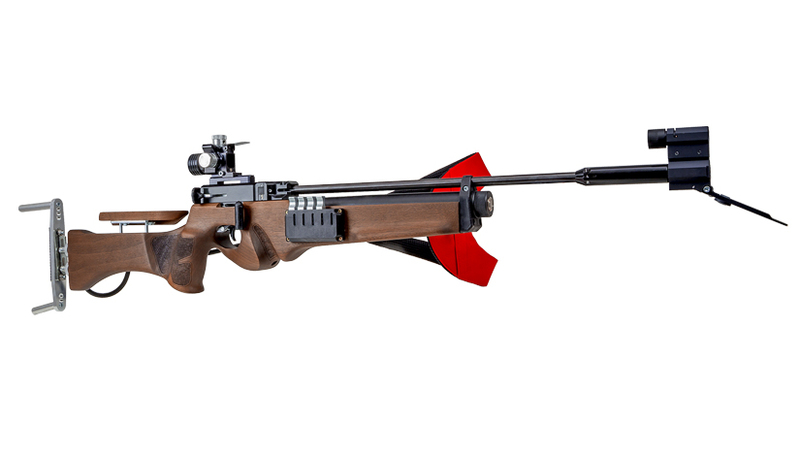 The rifle is equipped with a circular front sight and an adjustable dioptrical sight with a 0.05 mm tuning interval. Both the front sight and the rear sight are closed with movable curtains, protecting them from falling snow during the race. One of the important components of this biathlon rifle that undoubtedly influencing the outcome of the race and shooting is the system of shoulder belts, which reliably fix the weapon behind the sportsman’s back. The rifle kit includes a shoulder strap with a standard mounting system that is compatible with most of the produced belt models. There are fastenings for an additional short rifle sling in the front part of the rifle stock. Turning on the rifle is made with a button at the end of the rifle stock. This new biathlon rifle derived all its features including the optical system, electronics and all the functionality from our previous model. It also has a fire adjustment mode. To enter it, press the reload lever, turn on the rifle and press the trigger three times. In this case, the laser emitter will go into continuous shooting mode for sight adjustment. By pressing the reload lever three times more, you will enter the settings mode, where you can set the number of additional cartridges, the number of magazines, the type of reloading and sound effects. Pressing the reload lever selects the next option, and pressing the trigger confirms the selection. The rifle is powered by a lithium battery. You can charge it with any 5V charring device that has a mini-USB connector. The charging socket is located on the left side of the rifle stock. The design of the biathlon target was developed with the expectation of using large-scale assembly. It is made of a moisture-resistant composite. Due to decreasing of the weight, now the target can be easily disassembled and moved to another place. Therefore, compared with the electronic shooting room, where the event is confined to a particular spot, biathlon 2.0 is mobile and convenient. The fastening system is simplified. The target can be screwed to the stand in seconds. We use a special panel that has two options of target diameters. The player can select between two classic biathlon versions: 45 mm and 115 mm. The target can be quickly transformed for firing from a prone position or from a standing position. We completely updated the electronics in this new version of biathlon. We use new circuitry for hit sensors. Biathlon 2.0 now has several photosensors, not one as in previous versions. Due to this, hits are recorded not only in the center but also at the edges of the target. We have got excellent results during the tests: the laser spot is clearly recorded on the entire diameter of the target, and there are no false triggers outside the sensor zone. Great news for biathlon fans, coaches and sports players. LASERWAR made a new "Laser Biathlon" set. Young sports players will now receive the highest world standards level rifle for running fully-featured training sessions. This compact, stylish, lightweight, ergonomic rifle can compete with the best samples of biathlon weapons with which honoured sports players train.